Important things, tyres. After all, they're what get you from A to B. So it's important to keep your tyres in good condition – else you could come to a standstill. Better still. Keeping your tyres in good condition improves fuel efficiency, ride comfort and helps make your tyres last longer whilst giving you better grip on the road. We're here to keep you going. If you suspect your tyres have become damaged or are worn, pop into your local Honda dealer and we'll check them for you – we'll even match any like-for-like quote within 10 miles* as part of our Honda Price Promise. Why is maintaining tyres important? Keeping your tyres maintained doesn't just give you better grip on the road. It also improves fuel efficiency, ride comfort and helps make your tyres last longer. There are many factors that affect tyre life. It's not just about how well you drive, but also where and when you drive. Road conditions, surfaces and the weather can all play a part in aging your tyres. It's important to regularly check your tyres are inflated to the correct pressure according to our tyre pressure recommendations – especially before long journeys. These can be found detailed on the sticker mounted on your vehicle's door aperture. Keeping your tyres at their optimum pressure reduces your running costs and CO2 emissions. Check your tyres regularly for any visible signs of damage. This could be damage to the tyre sidewall or foreign objects embedded in the tyre. If you spot anything unusual, take your Honda to your local Honda dealership. Our trained technicians will take a look to give you peace of mind. If you notice your tyres are wearing more on one side than the other, then it's likely your wheel alignment needs adjusting. Just bring your Honda to your local Honda dealership and we'll put it right. 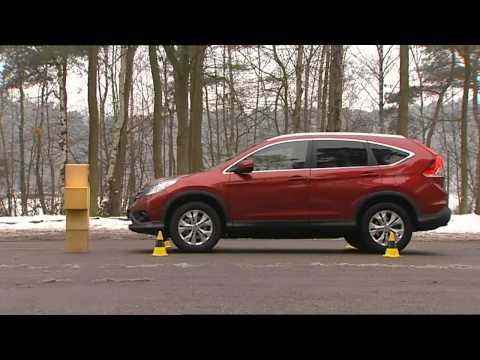 Tyre tread depths affects your Honda's stopping distance. The lower the tread, the longer your stopping distance will be – especially in wet conditions. We recommend that your tyres should be regularly checked. If the tread depth is less that 3mm the tyre should be replaced in order to maintain optimum driver performance and road safety. The minimum legal requirement is 1.6mm across the middle 75% of the tyre at any point. Any less and you could be faced with a £2,500 fine and 3 penalty points per tyre. If you are unsure what to look out for regarding the condition of your tyres, bring your Honda to us and one of our trained technicians will check them for you. What's the EU tyres labelling and legislation? In November 2012, a new EU Tyre Labelling Regulation came into effect, meaning ratings for fuel efficiency, wet grip and external rolling noise are clearly stated. Luckily, it's The Honda Way to be up front. So here's all you need to know about how they're rated. The lower the rolling resistance of your tyres, the less energy they use. Which means less fuel consumption and lower CO2 emissions. Each tyre is rated A-G, with A-rated tyres being the most fuel efficient. Tyres with excellent wet grip have shorter braking distances on slippery roads. Great for keeping you safe in the rain. Each tyre is rated A-G, with A being the best performer with up to 30% shorter stopping distances. A tyre's exterior noise grading is measured in decibels (db) and represented by one, two, or three sounds waves on the label. Tyres with two bars or less meet current EU laws. This is shown on the side wall of the tyre. It's worthwhile thinking ahead for the coming winter. Talk to your local Honda dealer about winter tyres and our winter tyre and wheel promotion today. 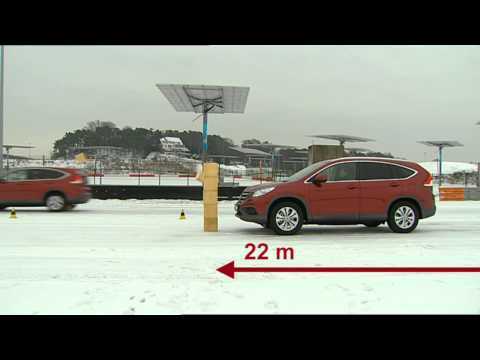 Watch the videos to see how much safer you can be on the road with winter tyres.